Heat-treated rod in one of the locking bars prevents from sawing. Small ball in the profiled square protects from drilling. False slots on the tumblers prevent from the possibility to pick the lock. 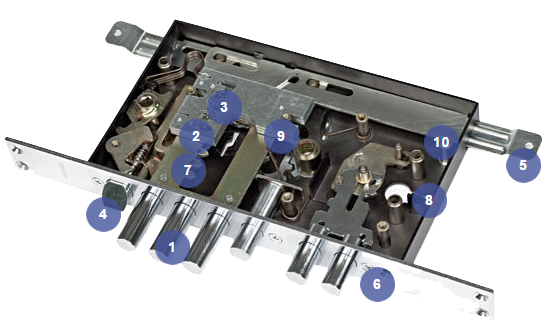 The latch is bigger than the locking bars, which provides smooth operation of the lock. An actuator for vertical rods provides the possibility to locks a door in three directions. Replaceable front plank is fastened with screws. Specially weakened cog on one of the tumblers protects from criminal opening. There is a possibility to install an armour plate on a cylinder mechanism. Corrosion-resistant coating of the guts and special tumblers design provide smooth operation of the lock even in adverse conditions. Protective bushings for the lock fixing reinforce the inflexibility of the construction.